Route description: The hike starts fairly flat between large trees. The trail then passes Long Lake. The approach continues to Isabelle Lake which is passed on the right hand side. From here for about another mile the trail climbs to a small lake without a name at 3481m. The next section is a small trail that heads (in switch-backs) straight up to the right, it is quite obvious. As soon as the trail reaches an area with large terasses, then leave the trail (it goes to the Isabelle Glacier) and head into the basin just below the Navajo snowfield (a large snowfield just below and right of the peak). The standard route heads up "Airplane Gulley", this is the gully that hits the ridge east of Navajo several hundred meters from the place where the summit pyramid meets the ridge. There is another gully to the right of this one, but it has a steep step in it. Another distinction is that Airplane Gulley has a fairly distinct pile of boulders spreading out in a V-shape at its bottom. The gully itself is easy and not steep, it was filled with (new) snow when we did the ascent, quite an easy walk up to the ridge. Actually, before the proper gully hits the ridge there is a branch going right (west). This is shorter and there is no reason not bto take it. Up here the wreckage of an airplane is very prominent. It is a C-47 (relative of the DC-3, see below) that crashed here January 21st 1948. Smaller pieces from the aircraft are scattered all over the gully, a few significant pieces have made it all the way to the very bottom of the gully. Once on the ridge, it is easy to follow it to the southern face of Navajo which is easily climbed until the very last rockband defining the summit itself. Angle about 50 meters right, there a very pronounced chimney, deeply set in the rock provides a direct and fun route to the summit. You exit the chimney to the left on two small easy ledges (we had partial snow, but still no difficulties), then a short, well protected almost flat mini-gully (25 feet?) takes you to the summit. There is another (slightly easier?) route that goes around to the west below the final rock-band, but we did not explore this. Comments: Pål Jørgen 11 years old and I did this hike on the first sunday of October. It took us 1.5 hours to the unnamed lake, then 2 hours to the summit allowing for a few nice rests for water and photos. We spent about half an hour on the summit and returned the ascent route except for cutting directly down to the lake where Heidi (Pål's mother) was waiting. A family hike back to the trailhead concluded the trip in a total of 7 hours. 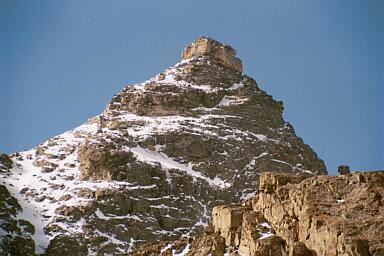 The Navajo Peak, notice the characteristic (steeper) summit block. 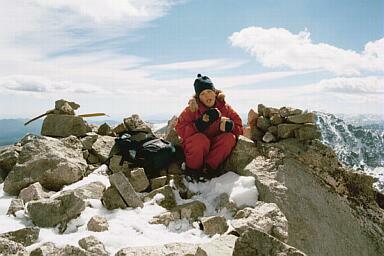 Pål Jørgen on the summit of Navajo Peak. 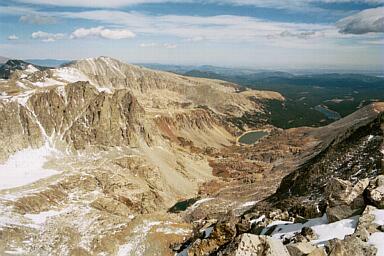 View east, the unnamed lake, Lake Isabelle and Long Lake. 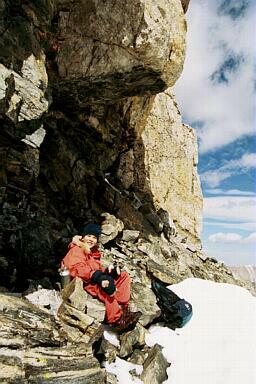 A rest just below the summit rock. The chimney route to the summit starts about 4m from here, about where the shaddow ends, the sunny rock face is past the chimney. 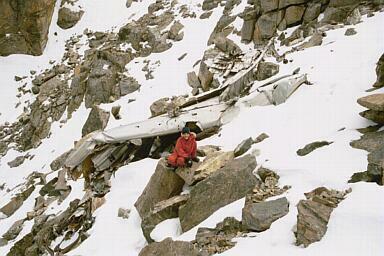 The remains of the C-47 that crashed high in the gully route to Navajo peak. (Later named `Airplane Gully') January 21., 1948. For news coverage see below.